The slope of a straight line measures a rate of change. When you graph a straight line, you notice that the rate of change (the slope) is the same between all points along the line. The rate of change for a straight line is said to be constant (not changing). The rate of change of a quadratic function, however, is not constant (it does not remain the same). There are no straight line segments on a parabola. So, can we speak of "slope" when dealing with a parabola? The answer is "yes, in a way", but the result won't be the same as what we have seen with straight lines. 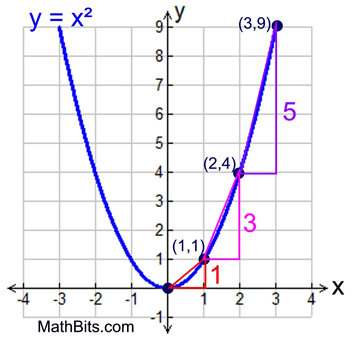 When we try to speak of the slope (or rate of change) for a quadratic function (a parabola), we have to speak of the average rate of change (the slope of the segment connecting two points on the parabola). The difference will be that this average rate of change (slope) will NOT be constant. It will change based upon the location of the two points being used. Let's take a look at the average rate of change along a parabola. 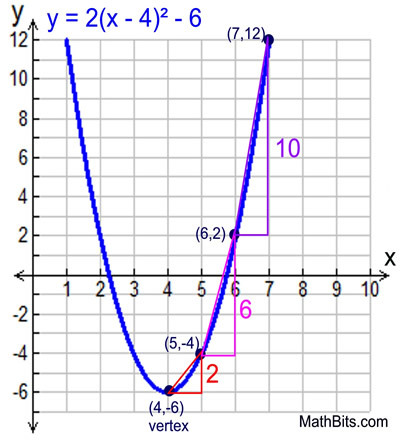 Consider the parabola y = x2. Do you see a pattern developing regarding the average rate of change at 1 x-unit intervals? This method is more difficult to use if "a" is not an integer. 1. Before you begin, check to see if "a" is an integer. 2. The Pattern is 1, 3, 5, 7, ... as long as the value of "a" is 1. Should "a" be negative, multiply by the negative. • over 1, up 1 - plot point. • from that point, over 1, up 3 - plot point. • from that point, over 1, up 5 - plot point. • from that point, over 1, up 7 - plot point. • over 1, up a - plot point. • from that point, over 1, up 3a - plot point. • from that point, over 1, up 5a - plot point. • from that point, over 1, up 7a - plot point. 5. Since the parabola is symmetric, plot the reflection of these points over the line of symmetry (the line through the vertex). Take a look at this example where the value of "a" is not 1. Notice that the pattern becomes 2, 6, 10 (which is "a" times 1, 3, 5 since a = 2). The left side was graphed by reflecting the points plotted on the right side of the parabola over the line of symmetry, which in this example is x = 4. The point (5,-4) becomes (3,-4) and so on. If you can find the vertex, this method is fast and easy.